These three tanks are part of the 113,500-L (30,000-gal) capacity stormwater capture and reuse system at the Grand Hyatt Atlanta. In all, the system has eight tanks. Stormwater, air conditioner condensate, and ice machine meltwater are collected and reused in the hotel’s cooling towers. 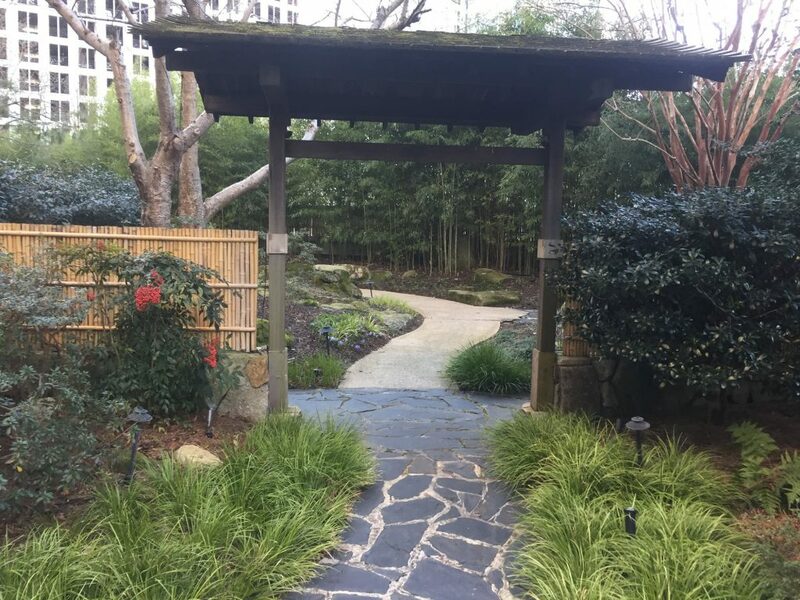 While rainy days during a vacation or business trip aren’t ideal, the Grand Hyatt Atlanta hotel in the Buckhead area of Atlanta, uses a simple stormwater collection and reuse system to make the most of wet weather. The hotel captures rain water from flat portions of its roof and an outdoor zen garden. It also collects condensation water from guest-room air conditioners and meltwater from ice machines. This water is stored in eight tanks with a combined 113,500-L (30,000-gal) capacity. The tanks sit in a garage just below the hotel’s lower lobby and convey water into the hotel’s cooling towers where the water is evaporated. Averaged over the year, this system provides about one-third of the 45,400 to 56,800 L/d (12,000 to 15,000 gal/d) of water needed for the cooling towers, according to Rob Jones, the hotel’s chief engineer. Jones oversees the stormwater capture and reuse system as well as operation of all systems for the 439-guest-room hotel. During the Water Environment Federation 2018 Midyear Meeting, which was hosted by the hotel, Jones provided tours of the stormwater capture and reuse system to water professionals. The tours of this system followed a spate of rainy days, so the system was holding more than 73,800 L (19,500 gal) of collected water. Green first flush tanks screen larger particles from the collected water. Mesh filter bags inside the tanks provide additional screening for finer materials. To capture stormwater and graywater, the hotel simply rerouted drains from the municipal sewer line to the storage tanks, Jones said. The water flows through a first flush stack filter to catch larger debris; then, filter bags inside the tanks catch any remaining particles. The system operates fully by gravity. However, it also uses ultrasonic sensors to monitor the water level in the storage tanks. 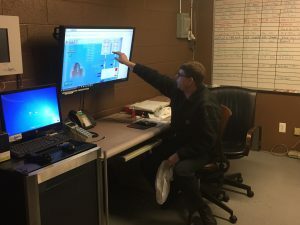 These sensors are connected to a building management system that also can control the valves that empty the tanks into the cooling tower uptake pool. Since the system went online in 2013, it has provided about 17 million L (4.5 million gal) of cooling-tower water. This translates to a savings of about $38,000 to $40,000 so far. The hotel installed the system for a cost of between $90,000 and $100,000; the estimated payback period is about 7 years. Chief Engineer Rob Jones oversees the stormwater capture and reuse system. The system includes ultrasonic level sensors and valve controls that are connected to a building management system. 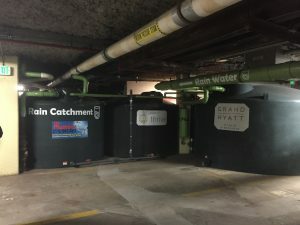 The stormwater capture and reuse system is just one piece of the Atlanta hotel’s contributions to Hyatt’s Thrive sustainability vision, which is committed to reducing greenhouse gases, energy use and water use at Hyatt properties around the world. 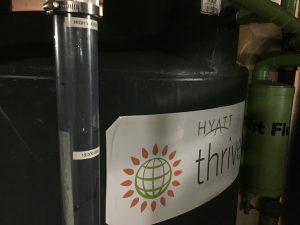 Other Thrive projects at the Grand Hyatt Atlanta include rooftop-based solar panels that help heat water for guestrooms and a laundry water recycling system that captures and reuses about 84% of the water and a large portion of the heat used in the hotel laundry room. The hotel pursues these systems because it wants to be green, Jones said. But, he added, these systems are also financially motivated. Atlanta utility customers pay some of the highest water rates in the country, so it made good sense to capture and use the water that was falling right onto the hotel, he said. Rain percolates through the soil in the hotel’s zen garden and is collected by underdrains that empty into storage tanks a few levels below. To capture this water, the hotel simply piped the drains into storage tanks instead of the sewer.